CUAHSI, the Consortium of Universities for the Advancement of Hydrologic Science, announced its Spring 2008 Cyberseminar schedule. The cyberseminars are free. A cyberseminar is a PowerPoint presentation shown over the WWW in conjunction with narration by the presenter via a conference call. Click on the link above for dial-in instructions. Here is the Spring schedule (all cyberseminars are at 3 PM, Eastern USA); note that the first one is tomorrow. I got this article from AFP and have reprinted excerpts below; Brown and Caldwell's California Water News first alerted me to it. It's about a new film, "Flow", that takes on water profiteers. I have not seen this film, but from the story, it seems that this might be akin to a Michael Moore film - some valid points, but with a fair dose of hyperbole. Still, people like filmmaker Irena Salina and activist Maude Barlow are necessary elements of civil society. Like Moore, they serve to poke a sharp stick in our collective eye and keep us from getting too comfortable. "Flow" premiered at the Sundance Film Festival last week. The film by French-born director Irena Salina condemns water profiteering, the World Bank for supporting large-scale water projects that have displaced tens of millions of people, Paris-based Suez and Vivendi Environment for commercializing water systems around the world, and Nestle, the world's largest bottled water seller, for draining watersheds. I have some complaints about the World Bank. Try micro-financing and micro-projects, guys. Bigger is not always better, unless you're a multi-national engineering firm. I do not necessarily oppose the commercialization of water systems, as long as there is public oversight and there are lifeline rates. "It's a very dangerous trend, at a time when clean drinking water is becoming scarce, even in the United States, the richest country in the world," said Salina in an interview with AFP. "We can't let companies continue to pollute our water. We need strong regulations to stop that, and also to stop them from draining our watersheds for profit," she said. Along with a collective of activists, she is calling for a binding international treaty to protect the human right to water, as well as tougher local laws to prevent contamination of watersheds and water profiteering. Her film documents African plumbers secretly reconnecting shantytown water pipes to ensure a community's survival. This is interesting. When I attended the Third World Water Forum in Kyoto in 2003, one of the sessions was an "open mike" session for community groups. One black South African got up and related an odd story. When South Africa was apartheid, he had free water. But when "his people" (the ANC) took over, his water was no longer free. He found that puzzling, as did most of the people present. It also shows a California scientist who exposes toxins in US water supplies, a "water guru" working to provide clean drinking water in India, and the CEO of Suez who argues for privatization as the wave of the future. "It should not be possible to be running out of water," Maude Barlow, a Canadian activist and author of a book on the water crisis, "Blue Covenant," told AFP. "But by mining groundwater and watersheds at the current rate, and contaminating water, we're actually losing water from the closed hydrologic cycle, and soon we'll be facing a water crisis." A few words here. Depending upon whether the "mined" ground water is fossil water, we may actually be adding water to the hydrologic cycle. But "mining" water does not remove it from the global hydrologic cycle, unless you inject it deep into the earth's crust or something. And "contaminating water" does not actually remove water from the hydrologic cycle. The water may not be available for certain uses, but it is still in the hydrologic cycle. Each year, water-borne diseases kill more than HIV, malaria, and wars combined, she noted, citing a World Health Organization (WHO) estimate. An exact figure was not available. I suspect this is true. I have heard a figure as high as 12,000,000 deaths per year from waterborne diseases. More than one billion people worldwide live without access to improved water sources, according to the WHO, and Barlow suggested 36 US states will run out of easily available fresh water in the next five to 10 years. "This notion that there is unlimited water to go around is wrong," she said, warning that water shortages were a potential cause of conflict. Well, Barlow's right - we do not have unlimited water to go around. Here is some info on her contention about the 36 states - it's on Robert Osborne's Watercrunch blog, a GAO report, no less. "We're running out of clean drinking water as the population grows and demand grows exponentially. Suddenly there will be conflicts over water between countries, between rich and poor, between rural and urban areas." Barlow got involved in the cause when water was included as a trade-able commodity in the 1994 North American Free Trade Agreement (NAFTA). She has since pressed governments to enact strict laws to restrict agri-business and commercial uses of water. Drinking water currently accounts for only 10 percent of its use, the film notes. The NAFTA issue is indeed intriguing, as it treats water as an economic good, and there is some real concern that it might trump water/environmental treaties or other agreements, perhaps even states' water laws. Barlow warns that the bottled water trend, worth some 100 billion dollars in sales annually, and the creation of water cartels that own water delivery systems will lead to greater water shortages for the poor. "Suddenly, water has become very big business," she said. In one lighter scene in the film, a US restaurant serves "l'eau du Robinet" (tap water) to unsuspecting diners, and other faux bottled water brands, actually from a garden hose behind the restaurant. One patron comments: "Oh yes, it tastes much better than tap water." Hey - I support her when it comes to bottled water. No hay problema, Maude. "We want it understood that nobody has the right to appropriate water for profit while people are being denied access to clean drinking water," Barlow said. "Getting a UN covenant passed won't solve the problem, but it will shed light on it." Today's posts come courtesy of Aquafornia, who alerted me to a story from the Las Vegas Review-Journal describing the plans of developer Jim Rhodes to construct as many as 305,000 homes in the Kingman, AZ, area. Yes, that number is correct. In previous posts I had commented about 60,000 homes being planned for the Kingman area. But 305,000! That might make Kingman one of the larger metropolitan areas in the western USA! Andy Devine, Kingman's most famous celebrity, would roll over in his grave. Andy Devine Boulevard would become an 10-lane expressway. Dairy Queens would multiply like rabbits. Where would all these people come from? Coastal areas during sea level rise? What would they do? Why would they want to come? And in a related story, also from Aquafornia, promises that those of us in the Pacific Northwest, Canada, and the Great Lakes (but not eastern Nevada) will sleep more restfully tonight. Why? Because the Southern Nevada Water Authority (SNWA) has announced that it doesn't want water from those places. Spokesman Scott Huntley assuaged all our fears in a recent article in the Las Vegas Review-Journal. The accompanying illustration, by Anton, is from the article. I'll sleep more easily tonight, knowing that come tomorrow, the mighty Columbia River will be still be thundering out to the Pacific Ocean (unless our Canadian friends decide to dam it at the border). Imagine - all that water wasted, when it could be contributing to Kingman's bid to become a major metropolitan area. Wonder if SNWA has heard of NAWAPA? The World Economic Forum concluded its annual meeting in Davos, Switzerland, yesterday where it placed a new emphasis on water. Here is my earlier post about the WEF's water efforts at this year's meeting. On 24 January the WEF presented a panel "Time is Running Out for Water", featuring a number of CEOs. Here is a summary of the session (also pasted below), and you can view a webcast of the panel on You Tube or the WEF site; the panel video is about 65 minutes long. UN Secretary-General Ban Ki-moon provides introductory remarks prior to the main panel discussion. Panellists in this session argued that global crises related to the escalating demand and inadequate supply of fresh water are as urgent as – yet more vexing and complicated than – efforts to tackle climate change. There is broad recognition today that water stress poses a risk to economic growth, human rights, health, safety and national security. Panellists agreed that no individual, firm or nation can escape the consequences of water scarcity. But they were sure that this challenge could be solved using collaborative approaches, political will, market mechanisms and innovative technology like those which arose in response to global warming. “The solution to water is more complex than the solution to climate change,” declared Peter Brabeck-Letmathe, Chairman and Chief Executive Officer, Nestlé, Switzerland; Member of the Foundation Board of the World Economic Forum. Also, water is inextricably linked to the consequences of and responses to climate change. “They are interrelated,” observed E. Neville Isdell, Chairman and Chief Executive Officer, The Coca-Cola Company, USA. With more heat, global warming accelerates evaporation rates and rapidly alters rainfall patterns. Anticipating concerns that making water a commodity could potentially be used to exploit the thirsty poor, the panellists agreed that a certain amount of clean water for drinking should be seen as a human right. South Africa and Oman have fostered both novel and ancient ways respectively to provide this right. But water for farmers, industry, swimming pools or gardens needs to be priced to prevent waste and inefficiency. It was refreshing to see the panelists agree that a certain amount of clean water is a human right and should not be commodified. Like them, I support the concept of water pricing, but the "lifeline concept" and a human right to enough water to survive are critical elements. The panelists did not seem very innovative, something surprising for heavyweight CEOs. It also would have been nice to have some "different voices" on the panel - maybe someone from an NGO that is heavily invested in water in developing countries. Perhaps the panelists could have committed to realizing the Millennium Development Goals (MDGs) related to water and sanitation by earmarking some of the profits from bottled water (Nestle and Coca-Cola CEOs were on the panel) to the MDGs. But the fact that the WEF decided to make water a major issue at its annual meeting is quite remarkable. 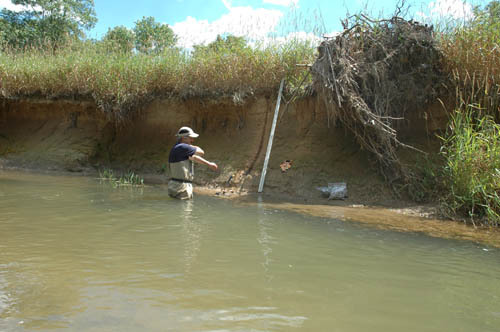 Two geologists at Franklin and Marshall College are suggesting that the models upon which stream restoration efforts have been based may be flawed because they were deverloped by studying "non-natural" streams, many of which are in the Mid-Atlantic states. Here is the New York Times' 18 January 2008 article by Cornelia Deans. Dr. Robert Walter and Dr. Dorothy J. Merritts, in a recent Science paper, say the streams studied by their geological predecessors were not “natural archetypes” but rather the artifacts of 18th- and 19th-century dam building and deforestation. The researchers examined historical records and maps, geochemical data, aerial photographs and other imagery from river systems in Pennsylvania and Maryland. 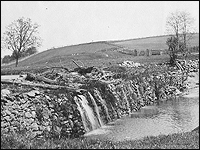 They discovered that beginning in the 1700s, European settlers built tens of thousands of dams, with perhaps almost 18,000 or more in Pennsylvania alone. In a telephone interview, Dr. Merritts described a typical scenario. Settlers build a dam across a valley to power a grist mill, and a pond forms behind the dam, inundating the original valley wetland. Meanwhile, the settlers clear hillsides for farming, sending vast quantities of eroded silt washing into the pond. Years go by. The valley bottom fills with sediment trapped behind the dam. By 1900 or so the dam is long out of use and eventually fails. Water begins to flow freely through the valley again. 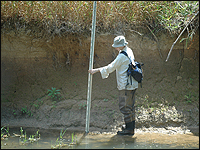 But now, instead of reverting to branching channels moving over and through extensive valley wetlands, the stream cuts a sharp path through accumulated sediment. This is the kind of stream that earlier researchers thought was natural. NPR also has an excellent story by John Nielsen on Walter's and Merritts' work. The two smaller pictures - of a dam and Merritts - are from the NPR story. The larger one of Walter is from his F&M home page. David Montgomery, a geologist at the University of Washington (UW), says the paper is also a cautionary tale for everyone involved in river restoration projects. For example, says Montgomery, "if you are trying to restore rivers in a way that will benefit fish and other organisms — if you're not just trying to make them look pretty — the best model for that is the system in which they evolved and thrived." Basically, if you want to put Humpty Dumpty back together again, you need to know exactly what he looked like in the first place. Merritts and Walter say it's likely that the landscape underneath a lot of winding rivers was dominated by broad wetlands full of tangled water channels. Walter says those broad wetlands are now all but nonexistent in the East. Whether they will be restored on a large scale is an open question, he says.